LEVONTA is the unique authorized seller on Amazon. Please pay attention to avoid purchasing counterfeit from other vendors. All items have been well tested, examined and packaged before sending. Surprise yours with the unique gift and melt his heart! Beautifully designed pocket watches make great anniversary gifts for men / best valentines day gifts for husband / unusual fathers day gifts for dad / last moment surprise gifts. 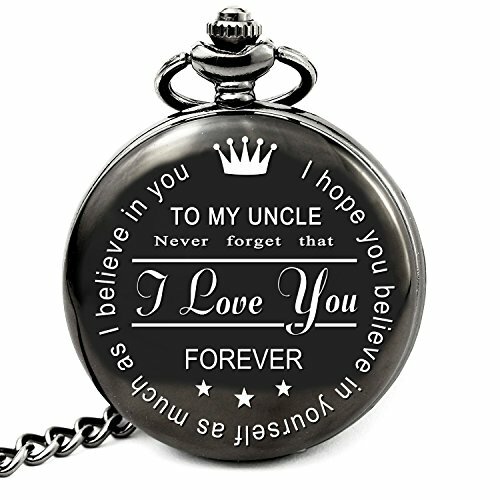 Engraved pocket watch gift idea featuring the words "To My Uncle: Never forget that I Love You. I hope you believe in yourself as much as I believe in you - FOREVER"
If you have any questions about this product by LEVONTA, contact us by completing and submitting the form below. If you are looking for a specif part number, please include it with your message.